Harry Potter’s fourteenth year is proving to be a memorable one, not only is it the four hundred and twenty-second Quidditch World Cup but Hogwarts is playing host to its own unique wizarding competition, the Triwizard Tournament. The school finds itself playing host to two visiting magical schools – the enchanting Beauxbatons Academy and the formidable Durmstrang Institute. Only three of the bravest witches or wizards over the age of seventeen may compete; their names to be drawn out of the enticing, golden Triwizard Cup. But this is no Quidditch match, the reward is glory but the perils are lethal and somebody has other plans in store. For when the time comes, the unthinkable happens; an extra name is recalled from the cup, Harry Potter’s name. Now Harry is fighting for more than victory, he is battling for his life, against an unseen sinister force. With even his friends doubting him, Harry finds himself more alone than ever and in the greatest of danger. The map of the wizarding world unfolds in this gripping fourth novel in the award-winning Harry Potter series. Waterstones invites you to compete alongside Harry as he faces fire-breathing dragons, delves to the deepest depths of the lake and (most dauntingly of all) learns to dance. This will be a parting of the ways, for after this, nothing can ever be the same again. 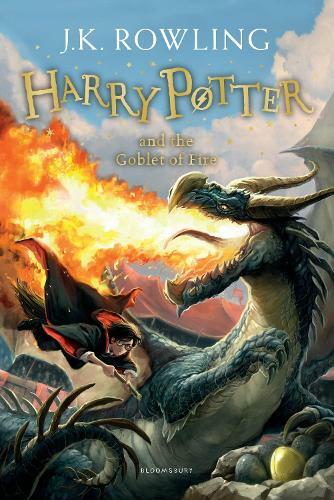 Take hold of the Goblet of Fire and who knows where it will take you. Harry Potter has been at the heart of Waterstones since the first copies of Harry Potter and the Philosopher’s Stone came into our hands. We’re delighted to share these new editions of the series, now entirely reimagined by one of our favourite writers and illustrators, Jonny Duddle. You can find out more about Jonny Duddle at www.jonny-duddle.com. Stunning. Amazing. Brilliant. Shocking. Funny.